Directors: Allen & Albert Hughes. Starring: Denzel Washington, Gary Oldman, Mila Kunis, Ray Stevenson, Jennifer Beals, Evan Jones, Joe Pingue, Michael Gambon, Frances de la Tour, Tom Waits. Having already been dealt a dollop of the post-apocalyptic with “The Road”, we are dealt another, in the same year, with this latest offering from “Menace II Society” and “From Hell” directors Allen & Albert Hughes. An atomic war has ravaged America leaving it a harsh and barren land. 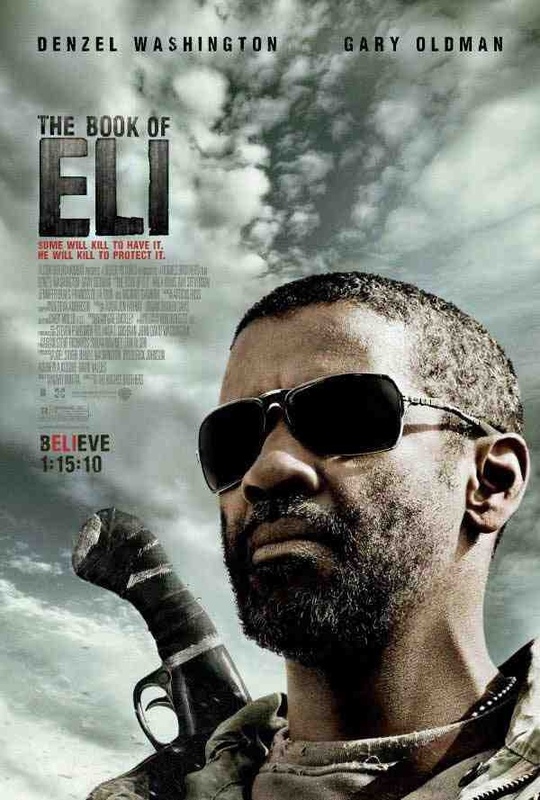 Wandering through this land is Eli (Denzel Washington), guarding his most precious possession – a book. Carnegie (Gary Oldman), boss of a small town, wants the book, which he thinks will give him power. When Eli escapes from town with Carnegie’s adopted daughter Solara (Mila Kunis), Carnegie and his gang set out in pursuit, in the knowledge that the book is in fact, the only one remaining of the King James Bible, that brings protection and guidance to whoever possesses it. Religious undertones – or overtones for that matter, as they are hardly subtle – don’t sit well throughout this modern, ethereal western. It unashamedly preaches Christianity from the heavens but if you can see beyond the religious mumbo-jumbo, the film has a lot going for it. The cinematography by Don Burgess is simply stunning in capturing the burnt-out and desolate apocalyptic landscape. Some of the images – although bleak – are beautifully captured and a photographer would be pleased to have them in their portfolio. The direction by the Hughes Brothers is slow paced, which adds to the loneliness of Eli, but when it kicks up a gear the action scenes are undeniably impressive and they handle it very well. In particular, the camerawork during the house shootout scene is magnificent, weaving in and out of the action, giving you a full immersive experience. Fine performances from a fine cast also, but both Washington and Oldman seem somewhat subdued this time round. They’ve done similiar roles in the past to much more effect but then I suppose it’s difficult for an actor to convey any real emotion when they’re wearing sunglasses for almost the entirety of the film. Great use of music also, adding to the overall supernal feel. However, with all the effort and talent involved in this, it’s the story that’s left lacking. There are numerous inconsistencies and the “Bible shall set you free” message, leaves a bad taste. Essentially it’s “Mad Max” on “The Road” with a little “Children of Men” thrown in. Plenty to enjoy, but at times, I had the feeling that I should have been wearing my Sunday best, during the sermon. This entry was posted on January 28, 2012 at 11:22 am and is filed under Action, Western with tags 2010. You can follow any responses to this entry through the RSS 2.0 feed. You can leave a response, or trackback from your own site. Great review here Mark! I enjoyed this movie, but there really was an excessive amount of biblical preaching, but beneath that there was some cool stuff going on. It was a lovely film to look at, the cinematography was fantastic and when the action kicked in it was handled really well. I think you scored this really fairly! I definitely wasn’t keen on getting the bible rammed down my throat, Zoe, but I’d agree with you. Everything else was pretty impressive. Not a bad film at all. Yet it had the potential to be better minus the sermon. Meh. Not usually the thing that appeals to me when watching something. Couldn’t agree more, Zoe. Overly religious crap normally puts me off too.